When people ask me what it is that I’m studying for my PhD research, my answer usually begins with, “Have you ever heard of the group Quantified Self?” I ask this question because, if the person says yes, it’s a lot easier for me to explain my project (which is looking at different forms of mood tracking, primarily within the context of Quantified Self). But sometimes asking this return question makes my explanation more difficult, too, because a lot of people have heard the word “quantified” cozy up to the word “self” in ways that make them feel angry, uncomfortable, or threatened. They don’t at all like what those four syllables sometimes seem to represent, and with good reason: the idea of a “quantified self” can stir images of big data, data mining, surveillance, loss of privacy, loss of agency, mindless fetishization of technology, even utter dehumanization. But this is not the Quantified Self that I have come to know. As I so often remind people, there’s a lot more to self-tracking than just Quantified Self; these days, there’s a lot more to “quantified self” (lowercase) than just Quantified Self (title case), too[i]. One thing that seems to get lost in all this is that, while Quantified Self may be at the forefront of some new methods of self-tracking, it did not initiate the growing popular interest in self-tracking; rather, Quantified Self came to exist because people were already self-tracking, and some of those people were interested in discussing their self-tracking experiences with others. While Quantified Self does undoubtedly help spread interest in self-tracking (just as increasing interest in self-tracking helps drive the growth of Quantified Self), I think the group’s more significant cultural impact has been to make the very concept of self-tracking more visible—and in so doing, to make tracking-in-general more visible. It is this last function, of making more visible a particularly disconcerting thing that usually fades into the background (e.g. being tracked by others), that I think is at the heart of some people’s deep discomfort when I say “Quantified Self” out loud. Yet, in losing track of the distinctions between Quantified Self (title case) and “quantified self,” or between Quantified Self and self-tracking generally, we also lose track of what I increasingly believe is most noteworthy about Quantified Self: its reflexivity. “QSers” don’t just self-track; they also interrogate the experiences, methods, and meanings of their self-tracking practices, and of self-tracking practices generally. Over the last two years, I’ve watched reflexive engagement with self-tracking become an increasingly important part of Quantified Self culture (which is something I find very exciting). In fact, I argue that Quantified Self’s most central object of concern has slowly shifted from the tools people use to track, to the data those tools and other self-tracking practices generate, to self-tracking practices as meaningful ends onto themselves, to developing “reflective capacities” not just through self-tracking practices, but in regard to self-tracking practices. Whether or not one sees Quantified Self as a harbinger of Data Doom, the group is also working to ask questions and to develop practices that could help to resist the very doom that the words “quantified self” sometimes seem to signify. Chang’s quote demonstrates why it’s important to differentiate between “quantified self” (lowercase) and Quantified Self (title case)—because wow, they are different beasts. Granted, Quantified Self has adopted what anthropologists Dawn Nafus and Jamie Sherman aptly describe as a “big tent policy,” and there were certainly folks who thought Chang’s characterization was spot-on. My own reaction, however, was an incredulous, “Wait, what?” Or, as then-Director of Quantified Self Alexandra Carmichael said, “‘QS is about gamification and shopping’? Where can I vomit….” If I’d had any doubt, Chang’s interview was a clear sign that the term “Quantified Self” had escaped into the lexicon and, as “quantified self,” taken on a life of its own. We are on a quest to collect as many personal tools that will assist us in quantifiable measurement of ourselves. 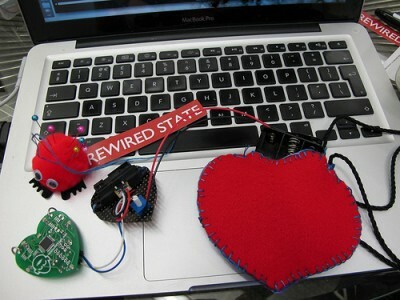 We welcome tools that help us see and understand bodies and minds so that we can figure out what humans are here for. Users groups, when they succeed, are wonderful things; informal but deeply engaged learning communities operating outside the normal channels of academic and commercial authority. Here at the Quantified Self, we want to know what these new tools of self-tracking are good for, and we want to create an environment where this question can be explored on a human level. If people from start-ups were less visible (as such) at Quantified Self Europe 2013, academics seemed to be more so. This may partially have been due to a (possible) higher concentration of us: at Palo Alto’s Quantified Self 2012 last fall (618 attendees total), the breakout session I helped lead for academics, researchers, and people interested in research about Quantified Self had about 28 participants (4.5%), whereas the informal breakfast session I hosted before the second day of Amsterdam’s Quantified Self Europe 2013 this spring (285 attendees total) had 23 people join despite the 8:00am start time (8.1%). It felt different to be an academic at Quantified Self Europe, too: While I’ve always felt comfortable and welcome within the Quantified Self community (so much so that this feeling was Reason #2 for picking my dissertation project, right after, “Oh wow, mood tracking is fascinating”), I’d never felt so appreciated as a social scientist before, at any conference or in any context at all—and I really don’t think that sensation was just me having a two-day moment. Across disciplines, across professions, and across reasons for being at the conference, there was no shortage of people excited to debate hard questions about (for example) what a “self” is and how it might come into being. Cultural anthropologist Natasha Dow Schüll led a breakout session called “Reflections on Algorithmic Selfhood,” and the discussion was so good that 90% of the (packed) room stayed more than 15 minutes past the session’s end to keep talking. While there were a number of people I recognized as other academics in that room, there were a number of non-academics, too. Some of the biggest differences, however, became apparent when I compared Quantified Self Europe 2013 to Mountain View’s Quantified Self 2011, the very first Quantified Self conference. In Mountain View, medical doctors and insurance company representatives were a highly visible contingent; many of them were at the conference to look for apps or other tools that they could bring into their practices and businesses. By the end of Quantified Self Europe 2013, however, I could still count on one hand the number of times I’d heard anyone say the word “compliance.” Some of this was undoubtedly due to the huge structural, political, and economic differences between most European healthcare systems and the US healthcare system, but my observation made me stop and realize that I hadn’t met any insurance company representatives last fall in Palo Alto, either, and nor had I seen a significant physician presence at Quantified Self 2012. I saw a doctor give a presentation about how mindfulness had improved his relationships with his patients, talked for a bit with one of the doctors I’d met at Quantified Self 2011, and remember at least one medical researcher in my breakout session, but that was about it. Obviously these are just my own experiences at these three conferences, and I’m sure other conference attendees’ mileage did indeed vary. 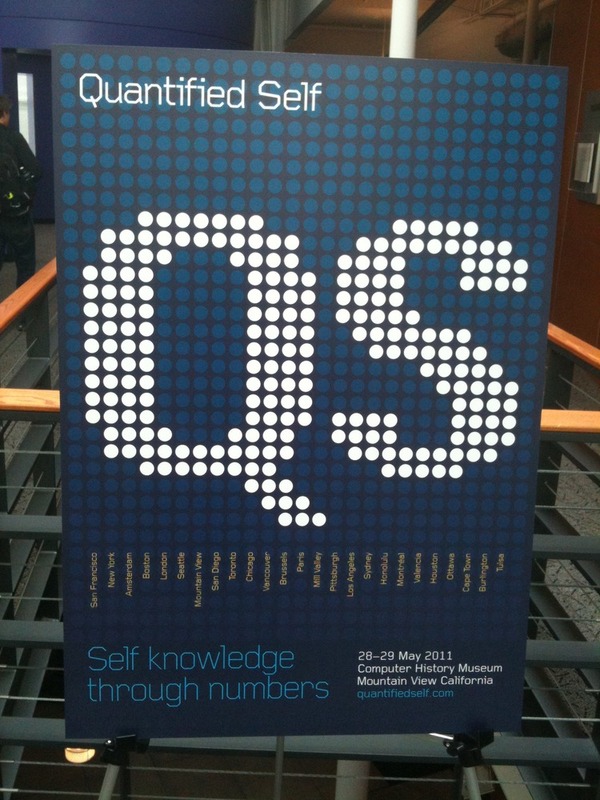 At the same time, other multi-conference attendees at Quantified Self Europe 2013 corroborated my observations. 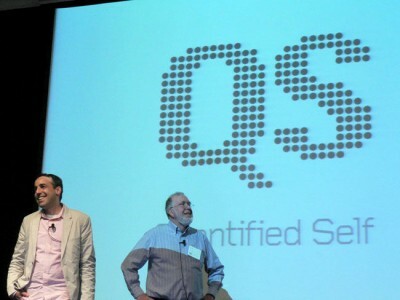 As one said, “In 2011, [medical doctors and insurance company representatives] had to be there”; especially with all the press leading up to that first conference, “QS was seen as the next big thing.” He agreed, however, that it now seemed as though many of that group had quietly disappeared, perhaps because they’d realized that a bunch of people “operating outside the normal channels of authority” were unlikely to teach them much about getting patients to follow orders. 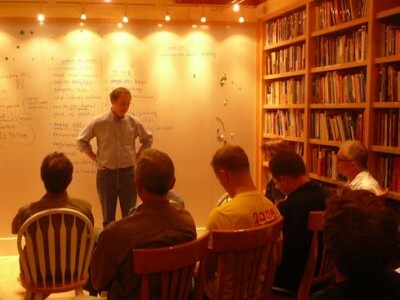 After all, if Quantified Self had a motto, it would be, “Do what works for you”; the overarching theme of QS Show & Tell presentations is not, “Here’s what you should do,” but rather, “Here’s what worked for me.”[ii] To those of us who pay attention, it is abundantly clear: the ethos of Quantified Self is curiosity, not compliance. Similarly, some of the main themes that I saw running through discussions at Quantified Self 2011 were issues of how to design n=1 experiments that are more scientific; how to learn (or teach people) to do more statistically rigorous analyses of self-tracking data; and how self-trackers might pool data from their n=1 experiments to do larger research studies, all of which are concerns related to making Quantified Self practices fit more readily into the molds of institutional science and biomedicine. By Quantified Self 2012, however, the focus had shifted: as I wrote at the time, the overarching theme of that conference was mindfulness. Many people still wanted to make objective (“objective”) sense of their self-tracking data, of course. 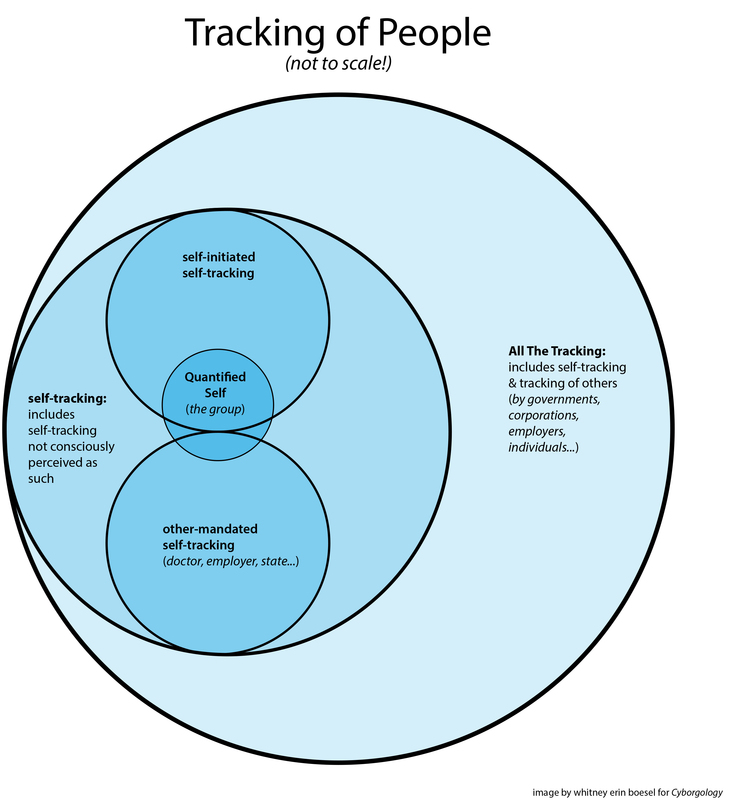 But overall, I saw more discussions about “how I feel my self-tracking practice has affected me” than about “here’s what I’ve proven with my self-tracking data.” Problems of “proving” things to medical providers remained very real for some individual QSers, but at the macro level, Quantified Self had moved on to do “what works for me”; it no longer seemed hungry for institutional science’s approval. This trend held at Quantified Self Europe 2013, but something else was becoming more visible as well: namely, the extent to which Quantified Self has become reflexive about itself as much as about self-tracking. At Quantified Self 2011, Kelly had asked, “Who owns your face if you go out in public?”; at Quantified Self Europe 2013, Wolf asked, “How do you say, ‘Please don’t life-log me?’” On the conference main stage, Quantified Self was now taking up the issue of how doing “what’s right for you” can affect the people around you, too. At the same time, my gut feeling right now is that the Quantified Self conferences are shaping the way Quantified Self is developing—both as a community and as a cultural phenomenon. 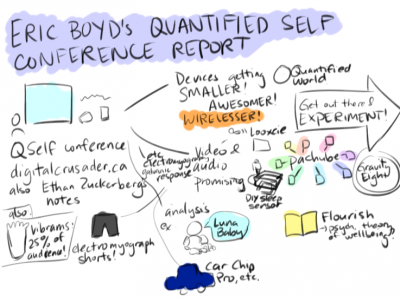 The conferences are certainly the most visible Quantified Self events, and there are now more than a few meetup groups that were started by people who returned home from a Quantified Self conference inspired to become local organizers. 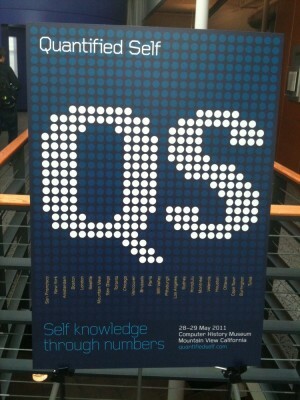 There’s also the unique way that a Quantified Self conference is put together: rather than build conference programs from submitted papers or abstracts, organizers assemble each “carefully curated unconference” by researching and then reaching out to registered attendees. Organizers click on every Twitter or personal webpage link that attendees provide during registration, in order to get a sense of who is coming and what they care about; organizers then get in contact with individual attendees to find out more about what those people are doing, and to ask attendees who have given memorable Show & Tell talks at local meetup groups if they’d like to reprise those talks. While the smaller sessions aren’t recorded by conference organizers, the sessions in the plenary hall are video recorded and later posted online. In this way, a Quantified Self conference is a lot like a biofeedback session for the Quantified Self community: it reflects aspects of what the group is doing now in order to help shape what it does in the future. If I’m right about my biofeedback analogy, then I think the increasing emphasis on critical engagement and reflexivity that I see at the Quantified Self conferences is a very positive sign. True to stereotype, many QSers do still love their gadgets—but at its core, Quantified Self is about neither “sell[ing] this technology to ourselves” nor accepting technology uncritically; if Quantified Self could make questioning a Fitbit’s definition of “step” as popular as using a Fitbit, for example, I for one think that would be a great thing. As Wolf pointed out in his welcome speech for Quantified Self Europe 2013, there’s a difference between being Silicon-Valley style “reckless” and being “brave” when it comes to new technologies. And as Quantified Self turns more and more toward the latter, it may help us learn not only how to live with new technologies, but also how to shape their development—and how to resist them. Whitney Erin Boesel considered titling this post, “Who’s Afraid of Quantified Self?” …but then she didn’t. She’s also @phenatypical on Twitter. [i] One thing that certainly doesn’t help the confusion is that, when a popular press piece about “quantified self” includes the term “quantified self” in the title, “quantified self” (lowercase) also ends up appearing in title case. I now fairly often see “Quantified Self” in a headline with little-to-no mention of Quantified Self in the article body. [ii] “Here’s what worked for me” vs. “Here’s what you should do” seems (to me) to be one of the main things that distinguishes the Quantified Self community from the “life hacking” community, although the two do sometimes have significant overlap. Even when I’ve seen more “life hackery” presentations at Quantified Self events, however, the message has tended to stop short of “you should do this” (more “this is the best way”), and the people around me have still seemed to view the presentations within the same “take it or leave it” framework. [iii] I’m very, very excited to return to this question at Quantified Self 2013 in the Bay Area this fall, and to see which of the more recent changes I observed at Quantified Self Europe 2013 remain—as those that do remain are likely due to ongoing intra-community shifts rather than to cultural differences between various international subsets of Quantified Self community members. [iv] Quantified Self does “give out a lot of scholarships to PhD students or people in financial need,” which can defray the cost of registering for a Quantified Self conference (usually: a few hundred dollars). For attendees who don’t live in the Bay Area (or Amsterdam), however, the cost of travel and accommodation remains non-trivial.